This option for the design of the outer shell of the universal terrestrial dwelling is based on a 24:14:7 general ellipsoid, which produces a dwelling of a more aesthetically pleasing design. The circular ellipsoid shown on the left is the ideal shape for enclosing a standard 5-metre diameter activity area. 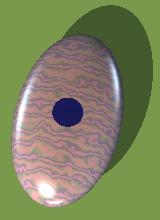 I used this as the basic shape of the units that made up the first design for my Universal Terrestrial Dwelling. As a stand-alone self-contained unit, the 7 by 3½ circular ellipsoid is fine. However, when the 21 circular ellipsoids necessary for the Dwelling are connected together, the resulting structure is complex and not aesthetically pleasing. It is not a form we see reflected in nature. The problem with a circular ellipsoid is that, whereas it provides an efficient envel­ope for the particular activity area it encloses, it does not incorporate connecting space to facilitate convenient communication with adjacent activity areas. Likewise, it incorporates no extra space for the service mechanisms and storage to support the activity that takes place within its central circle. 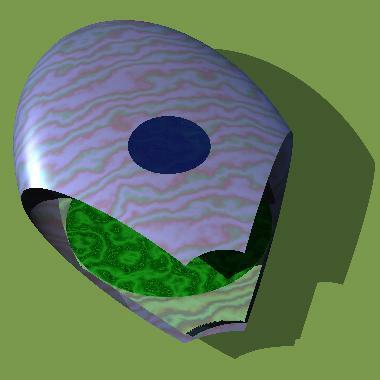 In my second design, I therefore stretched this basic circular ellipsoid to provide the lacking connecting and storage space. 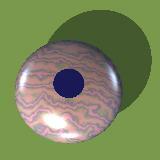 The resulting shape is that of a general ellipsoid as shown on the right. A general ellipsoid is one whose horiz­ontal axes are different from each other as well as being both different from the vertical axis. 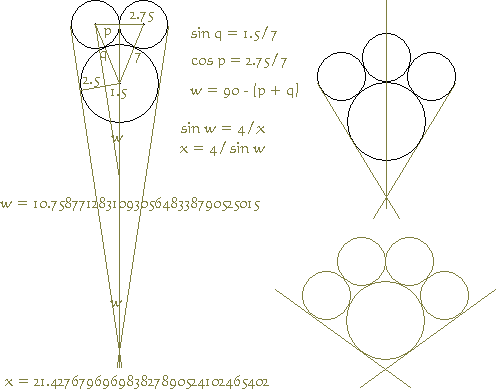 After much experiment, I found the best measurements for the axes of the general ellipsoid to be 12 by 7 by 3½ metres. Within this new shape, the 2 metre diameter skylight is there in exactly the same position but in place of the 5-metre diameter floor is a 5000 by 8571 millimetre elliptical floor with the original 5 metre diameter circular area marked upon it. 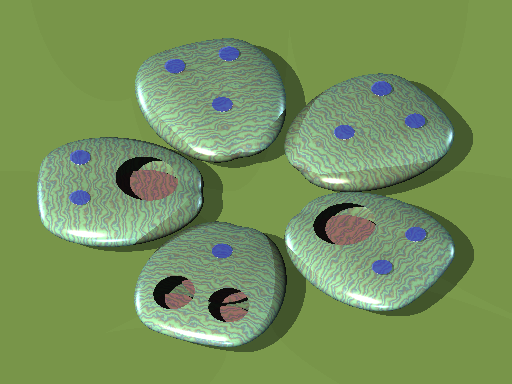 If 6 of these general ellipsoidal shells are arrange to form a daisy as shown on the left, with their major axes arranged radially, they all meet in the centre of the daisy. A benefit of this new design is that the need for a central hub unit has been eliminated. This results in a much simpler roof shape with more direct drainage routes. The 6 circular activity areas are in exactly the same positions as they were in the previous design. If we construct the hexagon that just encloses the 5-metre activity circle inside, we find that the vertical slicing necessary to make the ellipsoids fit together round the daisy is along the two radially-oriented sides of this hexagon. With this new design we can also see that the petals of the daisy extend further outwards, thus providing space beyond the activity circles for storage and support services. Cut a hole in the centre of the flower for the staircase or lift shaft. In this second design, the diameter of the transparent central cylinder is increased from 2 to 3 metres. This allows space for a 1-metre diameter centre post for a helical staircase with 1-metre wide ascenders. These are better dimensions for the helical staircases. Cut out the 4-metre diameter roof section from two of the 6 petal units to form the patio units. Cut off the outer tip of each patio petal so that it can mate with the corresponding patio petal of the adjacent daisy module. Finally, connect three of these new-style daisy modules together to form the compl­ete dwelling, an aerial view of which is shown above on the left. Below is a view looking horizontally at this new version of our Universal Terrestrial Dwelling. The transparent supports and staircase/lift cylinders can be seen beneath. Apart from its superior aesthetic appeal, the great advantage of this second design is that the entire dwelling is made up of only 18 essentially identical petal units as shown on the right. Below, on the left, is the floor plan of the dwelling. Each coloured circle represents a floor 5 metres diameter. Three room-groupings - dedicated to the three basic human activities of work, rest and play - are accommodated in separate modules. These three centres of activity are thereby separated by outside space. This minimizes the possibility of people engaged in one activity interfering with other people en­gaged in a different activity. For example, the noise of a social gathering in the play module should not disrupt the concentration of people in the work module or the sleep of people in the rest module. The entire floor area is on the same level, which is 3 metres above the ground. The rooms associated with each basic activity are clustered around its respective access staircase unit. Each room thus has direct access to the entrance staircase of the accommodation module of which it is a part. Two of the rooms in each module are what we call patio units. In our tropical clim­ate, these are open at the top. In temperate climates they could have a roof sec­tion, which opens when the weather is benign. Each patio unit is connected to a corresponding patio unit in an adjacent accommodation module by an open foot bridge. This is mounted through openings in the sides of the two patio units. For temperate climates the foot bridges could be enclosed. The essence of the work module is the two personal office or study units and the projects laboratory. These are supported by the washroom/toilet (WT) and the two patios. The staircase in the work module's hub unit gives direct access to the offices and project laboratory, so people connected with work can come and go without invading the privacy of the rest and play modules. The rest module is configured here with only one bedroom. However, the bedroom has an adjoining dressing room which, in turn, connects to an en-suite bathroom. The bedroom also has direct access to one of the patio units. At the other side of the module is a laundry room, which has direct access to the other patio unit where clothes can be hung out in the open to dry. The laundry room also has space for clothes making and repair. The staircase in the middle of the rest module's hub unit is only for emergency use. The space within hub unit can accommodate such things as exercise machines and first-aid medical equipment. The essentials of the play module are the lounge/auditorium (LA) and the diner-kitchen (DK), each of which has direct access to its respective patio area. A separ­ate washroom/toilet is provided for the play module. The remaining unit can be used for whatever purpose suits the users of the dwelling. I have designated it as a library, but it could also have other functions, or indeed be multi-functional. The central helical staircase of the play module's hub unit serves as the main entrance to the dwelling. The perimeter wall of the hub unit thus accommodates space for such things as out-door clothes and footwear. This floor plan is accommodated and protected from the elements within a shell system. Our geometrical ideal is based on an ellipsoidal shell design. 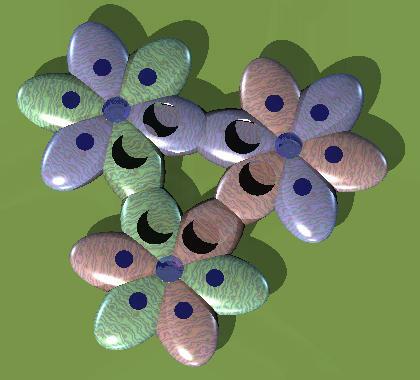 The above tri-flower design was created using the POVray program tri-flower.pov. A second, completely different alternative is the five-petal design shown on the right. 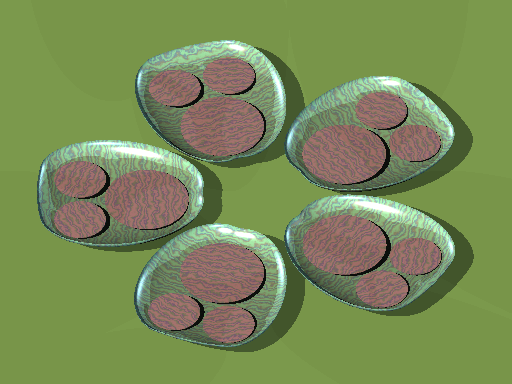 Each of the five separate shells is formed by merging a pair of radially offset general ellipsoids, thus creating a kind of heart-shaped enclosure. Each shell con­tains three circular activity areas: one 8 metres diameter and two 5 metres diameter. Sections of the roof are cut out where appropriate for open patio areas and skylights. 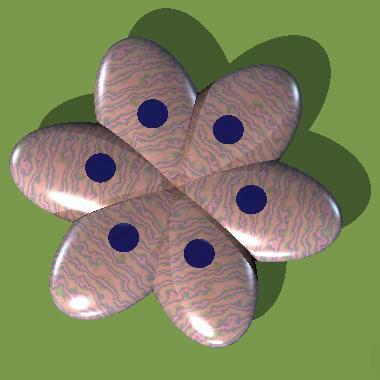 By making a progressive radial merge of the general ellipsoid, the smoother petal shape shown on the left can be created. As can be seen, patio and skylight holes can be placed in different arrangements according to different internal configurations of the activity spaces. 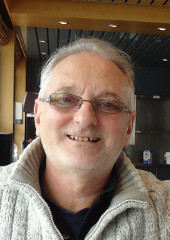 Communication between the modules is exter­nal. In other words, to get from one shell to another you have to go outside. On the right is shown a cut-away version of the dwelling. The top half of the structure has been removed, revealing the circular floors of the act­ivity spaces. 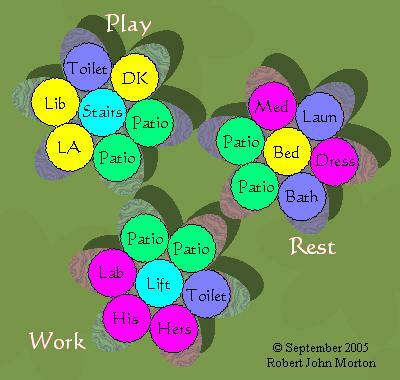 The different uses of these spaces can be allocated according to an activity analysis of the occupants' life-styles. Variants of this design can have 2, 3 or 4 small peripheral act­ivity spaces in each shell, according to the geo­metry shown on the diagram below. 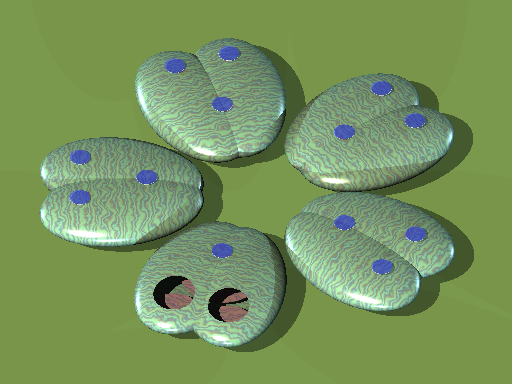 Other views and variants of the five-petal design can be experimented with using the POVray program five-petal.pov.